A hostage, said to be the priest, was killed by attackers, who stormed a church in the town of Saint Etienne du Rouvray at around 9am this morning local time. The location is in Normandy, France. The coat-of-arms for Saint Etienne du Rouvray, above, shows two leopards. Unconfirmed reports said the victim had his throat slit by the armed men, who were shot dead by police officers as they emerged from the church. Between four and six people were held by the attackers, including the pastor, two nuns and several worshippers. Initially, it was reported the priest was cut, but later local media discuss this as a beheading. The priest was Jacques Hamel. Hamel means hameau/hamlet. Meantime, a shooting has occurred in a Berlin hospital, with one doctor killed and the assailant dying by suicide. Jihad means "holy war." It appears this is what war looks like in the 21st century. 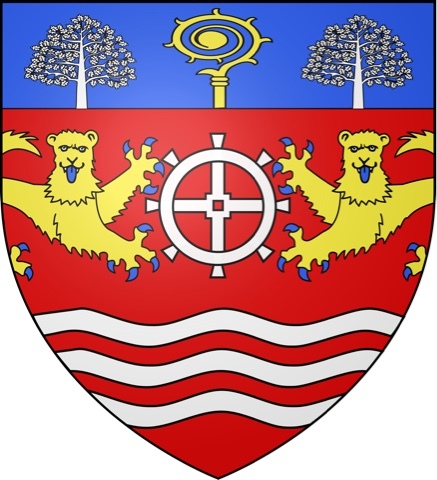 I just had a look at the coat of arms of Saint Etienne du Rouvray, where the Catholic priest was killed and the hostages taken. The central image of the eight-spoked wheel caught my attention. Immediate thoughts of the Wheel of Dharma, of course, but then I looked more closely and realized that it is the tenth card of the Major Arcana of the Tarot: The Wheel of Fortune. In the Waite-Rider deck, the wheel has eight spokes with the Egyptian gods Anubis and Typhon (dog and serpent respectively) on either side. That's Death and Evil. Represented here by two leopards. The crozier at the top of the coat of arms is represented in the oldest forms of the card by the goddess Fortuna holding a sceptre. In the Waite deck, by a sphinx holding a sword. It is said the French priest was beheaded. I mean, it's pretty much the same imagery as the Tarot card. Meanings vary, of course, but are always along the lines of a major change taking place, a kind of roulette wheel of chance and transformation of possibilities.